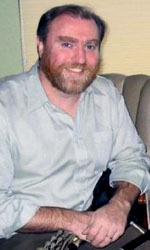 The 2010 Southern California Tionól will take place over the weekend of November 5, 6 & 7, 2010. We are delighted this year to welcome three exquisite pipers - Tom Creegan, Eamonn Dillon as well as pipemakers Joe Kennedy & David Quinn. Tom & Eamonn will handle the playing classes while Joe will set up at the reed table. 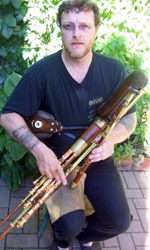 Joining Joe at the reedmaking table will be our local reed maestro Michael O'Donovan. Tom Dinner Concert Session & Party. Please BYOB! 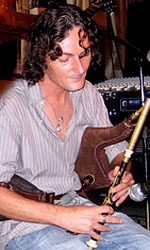 Born in West Belfast, Northern Ireland, Uillleann Piper and whistle player EAMONN DILLON has toured and recorded both as a solo artist and with a varied group of performers, touring shows and bands. Working between the US, Canada and Europe , he has performed and recorded as a featured artist in both traditional , theatrical and mixed genre ensembles, including NEEDFIRE, JOHN MCDERMOTT, (The Irish Tenors,) CELTIC BRIDGE, KING JAMES, SARAH PACKIAM, & PALOMA FAITH amongst others. He is currently in pre-production in the U.S. on his new solo CD, featuring his sister , acclaimed fiddle player ROISIN DILLON formerly of CHERISH THE LADIES, and other guest musicians and vocalists. I was born in Ingersoll, Ontario, Canada, and lived in a rural home outside of the town. As a child I enjoyed an active life and investigated many mechanical devices. I once destroyed an antique clock by taking it apart to see how it worked. It never told time again. My father had a wood turning lathe, he made table and chair legs as a hobby. By watching him operate the lathe I taught myself to run it. While he was away of course. I spent many enjoyable hours on that lathe making toys for myself. Later in life I made my first chanter on the same lathe. I was introduced to Irish music in the 1970s by a television programme called 'The Irish Rovers'. Several of the members of the group were from the North of Ireland. In the early 1990s I discovered the Union pipes, it wasn't long before I purchaced a practice set. Not long after that I produced a chanter, then a set of drones. With the help of friend Geoff Wooff I dabled at making pipes untill 2000 when I began building pipes full time. I specialize in narrow bore full sets. After seven years in the business I feel I've finished my apprenticeship and continue to learn and produce the best pipes I can build. I hope to continue being a pipemaker as long I'm able. Or until I win the lottery!